In the PassPort Administration UI, select Access > Domains. In the New Domain dialog enter the name Gotham. Note This name is referred to later in API Gateway when creating the Axway PassPort authentication repository. For more information, see Step 2 – Configure the authentication repository profile. Select External Identity Store with External Authorization (External). Deselect Only assign the default PassPort product. Select the identity store for the LDAP server. The identity store must already have been created. For more information on configuring LDAP, see the Axway PassPort Administrator Guide. 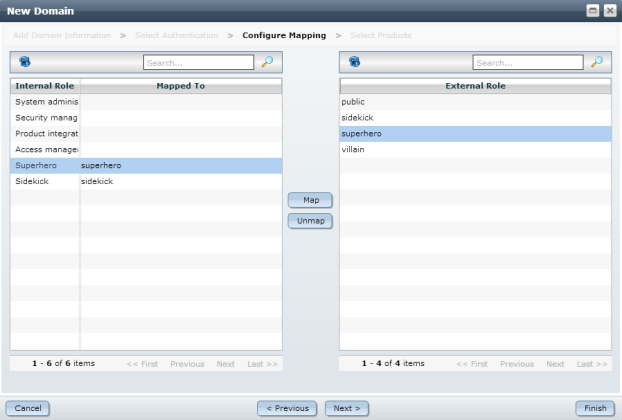 In the Configure Mappings section the roles in LDAP are mapped to corresponding PassPort roles. Map sidekick to Sidekick and superhero to Superhero.